After the New Year celebrations, Greg and I decided that we were going to try to be a bit more healthy. I was feeling really motivated! I had a few health situations that I was seeing doctors about, but getting no answers. After I complained to Greg for a bit, he suggested that I read his book by Alejandro Junger called Clean. His main concept is that we could be allergic or have sensitivities to certain foods and not even know it. He talks about how chronic problems that we think are just problems with our body, might be caused by a few different food or toxin triggers. And he said that sometimes our weight gain isn't just caused by too much fat and too little exercise, but it could be that our body is in a state of swollen-ness from something we are eating or exposing ourself to. This sounded like something that could be affecting me. Late last year, I started getting some red bumps on the front of my shin. They were only painful when the doctor applied pressure. But they kept getting worse and spreading all over my leg. I remember the night I had my final wedding dress fitting with my mother-in-law and my mom. I started crying because I was so worried that the bumps were a sign of cancer. I went to a few doctors and the dermatologist twice and the bills kept piling up. Blood tests, prescriptions, x-rays, and office visits sure add up quick when you have an HSA medical plan! So I decided to read this book. And the diet he suggested was really tough for us. Well, for me. Greg is a rockstar when it comes to eating healthy. He really turned around his health while serving a mission in Holland. He came home and got into exercising, competed in triathlons, a marathon, half marathons, and got into road biking. He went off sugar for a year, just to prove to himself that he could do it (and only stopped when he was in Italy and was told he needed to have real gelato). Last year when we met, he was on the Paleo diet and really happy about it. When we started dating, we kept using desserts as an excuse to get together. The second time we hung out, I told him he should come over and try mochi, and the cycle just continued. So by the time we got married, we knew that we had plenty of reasons to be together and we didn't always have to enjoy a sweet to celebrate! Ha! We followed the strict guidelines in the Clean program for a couple weeks, until I couldn't handle it anymore. I had really been enjoying cooking and trying new recipes now that I had someone to cook for. But the rules of the Clean program bummed me out and made me not want to cook. And when you love food and cooking as much as I do, it felt like a piece of me had died. I'm a little dramatic, but really, it was difficult. We couldn't have any sweeteners except stevia. Only fish and poultry, no fats except coconut oil, no grains except brown rice and almond flour, no dairy, and minimal fruits. Half of the meals were liquid because it's easier to digest your food when it's already been broken down. It seemed that his main concept was that when you're always eating, then your body is always working to digest. But if you don't give it a break then it has no time to clean up the rest of the extra food because it's too worn out just handling what you ate that day. But it was just too strict for me. I couldn't ever eat out and I felt like just getting off sugar was difficult, so to not be able to have cheese or bread was rough. I decided I couldn't do it anymore. But that I wanted to take some of the learnings we had from the diet. So we started making smoothies. Greg always has two boiled eggs and a green smoothie for breakfast. I always have wheaties (because you know, it's the breakfast of champions) but I started having a Greg breakfast. I felt really good and really healthy. There's something fun about carrying in a blender bottle to work and listing off all the ingredients that makes you feel really awesome. Every day I carried my smoothie in to work, I felt like I was a size 0 wearing black stretchy pants and I just finished running a marathon because I'm just so healthy. Ha! We started exercising more, but yet when I weighed myself a couple months later, alas, I had gained 6 pounds! So much for that size 0. Needless to say, I was pretty upset. I had cut most of the sweets out of my life and really upped the fruit intake. We were eating great, healthy balanced meals, but I was gaining weight! So we switched to Somersizing! 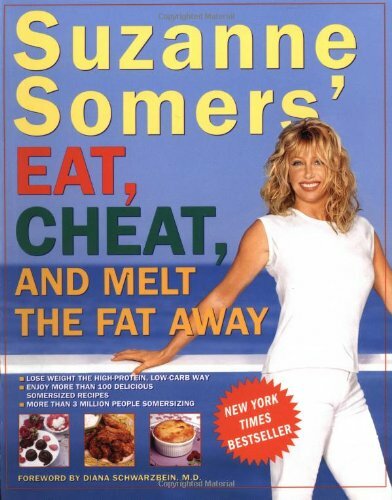 This is a diet plan from Suzanne Somers (you know, Step by Step, and thigh master) in her book Eat, Cheat, and Melt the Fat Away. My sisters and mom were on this diet a couple years ago and they all really liked it. Especially my mom, she lost a ton of weight! I thought it would be a good option because I knew that my genetics had success on this diet. Eat fruit by itself on an empty stomach (30 minutes before a meal or 2 hours after a meal). Eat at least 3 meals a day and do not skip meals. Eat until you're full. Wait three hours between meals if you're switching from protein to carbs. Do not eat protein or fat with carbs. The main concept of her plan is that we digest our food differently depending on what it is composed of, which makes sense to me. My body is going to handle a potato very differently than an orange. We did this for a few weeks. Unfortunately we started it the week before my birthday, so we had to cheat a few times but I think it helped us from going overboard on birthday sweets. It was very, very hard. But we were able to eat out and get salads very easily. We've had a lot of success, which might also be coupled with more consistent exercise. But Greg lost 10 lbs! And I have lost 5! In just 3 weeks. We've been really happy with the results but in general, we don't feel like it's a sustainable option for us. We talk a lot about the "sustainable future" and about trying to pick up habits that we can maintain for our life. For example, we've talked about some exercising programs and diet plans that might make sense for the short term, but if we can't hold on to them long term, then what's the point of adapting our lifestyle if it's just going to be a short lived change. We also use this phrase for a lot of things like "what's the best type of jobs we can have right now, what is the best color for our bedspread, what type of motorcycle should we get, etc. " As much as we've enjoyed the weight loss from the Somersizing, we both feel like we're eating too much dairy and meat. It is much easier to do a protein and fats meal than it is to do a carb meal, so it seems like a lot of our meals are very filling, which is good. But not when it feels too heavy or greasy. We've bought a lot of cheese- which is actually pretty fun to have an excuse to buy the fancy cheeses at Trader Joe's (I'm looking at you, Old Amsterdam Gouda!). We're trying to still follow some of the rules, but not quite as strict as we have been. I keep relearning the lesson that in all aspects of my life, BALANCE is the answer. Too bad it's so tricky to figure out what the right balance is. But, we're trying to enjoy the process. Basically I'm just really grateful for a husband who is so willing to go with the flow and try these new things with me. For someone who won't order his favorite burger and fries when we go out with his friends, but instead get a cobb salad so that he can support his wife's crazy ideas that will probably change tomorrow. Next up! Portion control! Before this year, I had never been on any diet program or basically anything restrictive. But as my metabolism catches up with my love of food, I'm realizing that now is the time to figure out what works best for me to be healthy. Testing out all the good ideas out there! So let me know if you have found something that works for you to maintain the size you want to be while also living a normal life without being obsessive about food! Sidenote: After hours and hours of research, I figure out that I had erythema nodosum. They are these spotty bumps on your shin that are really just fatty cells caused by an infection. I thought it would be worth getting a strep test to see if my strep throat last year hadn't really been taken care of by antibiotics. Sure enough, I tested positive for strep and was able to take another dose of antibiotics to clear the infection from my system. I learned the difficult lesson that you can't just count on doctors to have all the answers, but you have to put the pedal to the metal and do some work yourself. who knew that you had done a blog post about the VERY thing we were discussing last night!!!?! Love you being so open about this. Balance. Listening to my body. Why is it so so hard!?!? Love that Greg is very okay to do what is helpful! He is a keeper! !